This is such an important feast day for those of us who have loved ones who are not in the Church. We can spend these three days praying and sacrificing for them. 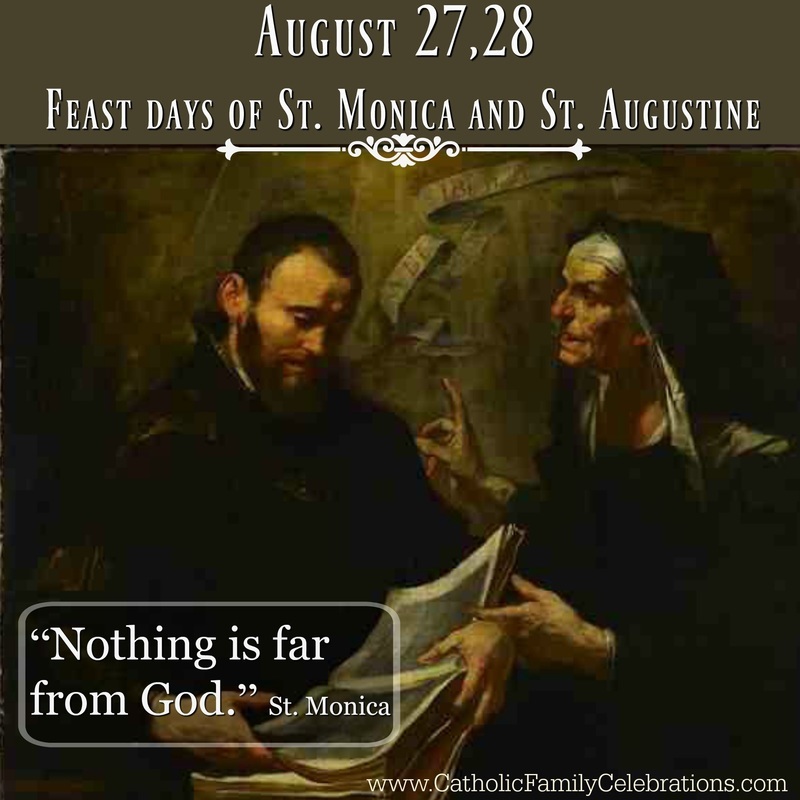 We can also celebrate God's goodness shown to St. Monica for her faithfulness and being a good witness for us. A three day novena is just right for me! I have such trouble doing nine whole days. This is from the St. Monica Sodality . If you are comfortable with this, give the specific names of the people for whom you are praying this novena. Perhaps even list their names and leave them on your dinner table throughout these three days so that everyone can remember and pray for them. 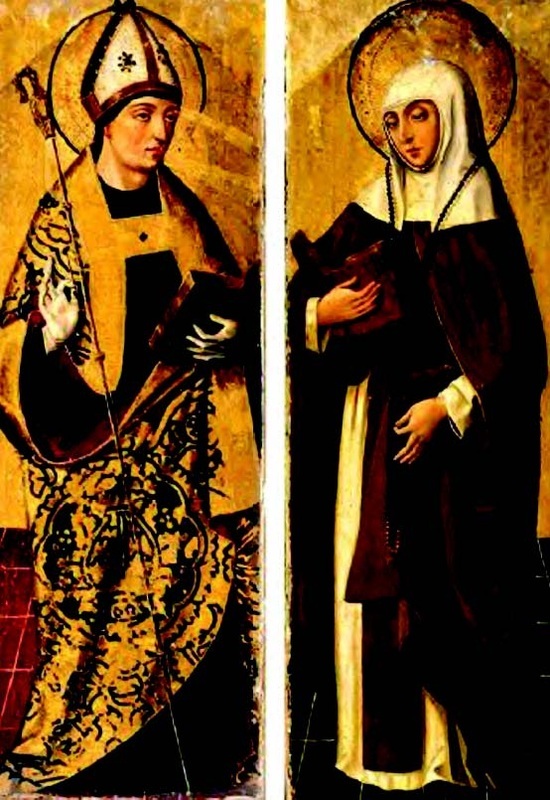 O glorious St. Monica, transfixed with sorrow when you saw your beloved child Augustine living in the dark and gloomy abyss of error and vice, and straying far from the right path which leads to true felicity in the possession of God and His holy grace, hear our prayer, O afflicted mother. By that cruel sorrow, which with so much patience you did bear, and by those earnest sighs and bitter tears with which you did appeal to God to change the heart of your prodigal son, and by your wondrous confidence in God, which was never shaken, O grant to us, your children, that we may, like you, place all our trust in God, and in our trials and troubles be ever resigned to His holy will. While we ask you, O glorious mother St. Monica, to supply for us our special needs, we here earnestly ask you to pray for the erring children of Jesus, so many Augustines, straying from God and hurrying to ruin. Let that earnest prayer of yours go forth once more for us and for sinners, that we may live in the light of divine grace and be united again thereafter to bless the bounty of a loving God for eternity. Amen. LET US PRAY. O God, look graciously down upon Your children who sigh in this valley of tears. With hope we pray for our daily bread, for the forgiveness of our sins, for the never-failing help of Your grace, and for the faithful fulfillment of Your promises: to find life everlasting and a happy abode with You in heaven, through the merits of Jesus Christ, our Lord and Redeemer. May God, through the merits and intercession of Saint Monica, increase our faith, strengthen our hope, and enkindle the fire of charity in our hearts. Amen. Our Father . . . Hail Mary . . . Glory Be. . .Saint Monica, pray for us. O glorious mother, St. Monica, although the many means you employed to accomplish the conversion of your son Augustine seemed fruitless, and for a long time God Himself appeared deaf to your earnest prayer and unmoved by your ever-flowing tears, you never lost confidence in obtaining the long-sought grace for Augustine. You lovingly and tenderly admonished your erring son; you watched over him ever with all a mother's love, and fearless of danger and heedless of fatigue, followed him from place to place in his weary and wayward wanderings. In a word, all that a mother's tender love could suggest, all that a mother's anxious solicitude could inspire, all that a wondrous prudence and true wisdom could dictate, you, O great St. Monica, cheerfully did to effect the return to God of your firstborn and darling child. By all these generous efforts, so happily crowned in the end, hear, O mother, the petitions we make to you. Pray for us, too, and pray especially for those who are unmindful of and ungrateful to God. To you, O dearest mother, we are especially dedicated; look upon us, then, as your children, and win for us the grace we need. Regard mercifully the most destitute among us, that sin being diminished, the number of the faithful may increase, and greater glory may be given to Him who is the best of friends, the truest of benefactors, our first beginning and last end, the source of all our hope, our Savior, our God. Amen.